Parenting - How Do You Think? I have learned some things of late that have congealed in such a way, so as to leave me in a bit of an existential crisis. One of my most precious beliefs, specifically, the importance of parenting style, as it pertains to child intelligence and personality outcomes, has been relegated to the proverbial dust heap alongside the id, the wandering uterus, and the Oedipus complex. Why would the salience of parenting style even come into question? It seems ridiculous to pose such a question. Of course parenting style matters! It is widely believed that parents can and do shape and mold their youngsters in a meaningful way that plays out in the formation of an adult. But, and this is a big but, the reality is that the impact of what you do as a parent has a much narrower impact than you might think. Genes are the sticking point. Epstein did not control for the effect of shared genes in this study. It is likely that children who have well functioning parents will be likewise well functioning, not because of the parenting style employed by their parents, but because of their shared genes. Well functioning and happy adults breed happy and well functioning children. Ultimately, parenting style, seems to have little impact on such outcomes. The current research from behavioral genetics provides a preponderance of evidence leading to the same conclusion: that the home environment, as it is influenced by parents, accounts for 0 to 10% of the variance in the personality and intelligence outcomes of children! Heredity (genes) accounts for about 50%. A long standing question about the remainder has ultimately pointed in the direction of the child’s peer group whereby they account for 40-50% of the variance on personality and intelligence outcomes (Pinker, 2002). As it turns out, peers are the nurture influence in the nature and nurture interplay. This latter notion runs counter to nearly everything we have been taught regarding human development over the last 100 years (Gladwell, 1998). Freud first put parents at the core of the child’s personality and neurosis development, and there they have remained. Mothers in particular have fielded more than their share of blame with regard to the pathology of their offspring. Cold maternal parenting style, after all, had been blamed for autism. And perfection seeking mothers have been blamed for the development of anorexia in their teenage daughters. We know that these relationships are unfounded. Regardless, the thinking persists, and bad outcomes are attributed to bad parenting whereas good outcomes are the fruit of sound parenting. The problem with this type of thinking is that the research has not born it out. The Minnesota studies of twins and the Colorado Adoption Project have made it clear (Harris, 1998): parents contribute their genes and that seems to be it. 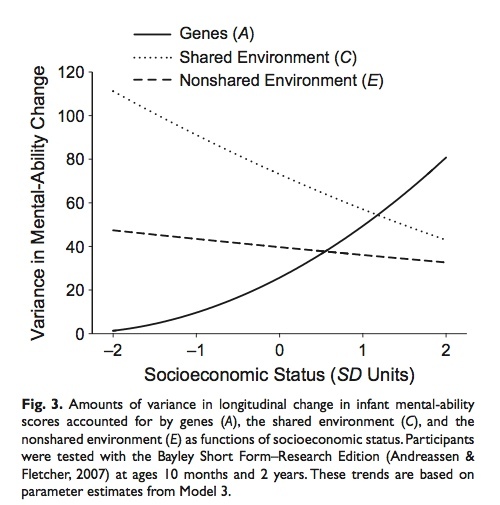 When it comes to personality variables such as openness to experience, conscientiousness, extroversion-introversion, antagonism-agreeableness, and neuroticism, parents affect this only through heritability. Factors like IQ, language proficiency, religiosity, nicotine dependence, hours of television watching, and political conservatism/liberalism are all hugely influenced by genes (Pinker, 2002). And consider smoking. Who can forget the TV ad portraying a child watching and pondering the emulation of his father’s smoking behavior. The slogan was something akin to “like father like son.” They had it right, but the smoking behavior in front of the child was not the culprit. Children of smokers are two times more likely to smoke as children of non-smokers. What we see is that nicotine addiction is heavily influenced by genes. Adoptive children of smokers do not have elevated rates of smoking, and this greatly diminishes the role that modeling plays in the equation. So does this mean that what we do as parents doesn’t really matter? And does it mean that my role as a child psychologist helping parents manage very difficult children is a waste of time? This is my crisis. Well … it does matter! How a parent treats and manages a child within the home will affect how the child behaves in the home and how the child feels about the parent. These are important issues. If poor parenting results in difficult feelings for the parent, “these feelings can last a lifetime – but they don’t necessarily cross over into the life the child leads outside the home” (Harris quoted in Gladwell, 1998). Here is the important point “whatever our parents do to us is overshadowed, in the long run, by what our peers do to us” (Harris quoted in Gladwell, 1998). The home environment is very important for all involved – and parenting style can greatly impact that environment. So parenting style does matter – if only for the establishment of sanity in the home. It seems to me that treating a child well is an ethical obligation. But if that’s not enough encouragement for treating another human being well, perhaps you should do so, in hopes that when you are old and frail, your children may treat you well (Harris paraphrased in Gladwell, 1998). We do know that parenting style can have adverse consequences when a child is subjected to neglect or abuse. This is hugely important! Its not that parenting style doesn’t matter. It matters greatly! Parents can establish a happy encouraging environment, provide for the development of essential skills and knowledge; BUT, again, over the long term, it seems that these contributions do not shape the personality or intelligence of their children. Their gene’s are responsible for their contributions. What seems to be more important, when it comes to shaping the genetic contribution, is where a parent raises their child. It’s the peer group that finishes the job. Now that is scary! And I thought my crisis was over. Gladwell, M. (1998). Do Parents Matter? Judith Rich Harris and Child Development. Annals of Behavior. The New Yorker.